Introducing the Sandwich Fair Association Fund, a new agency fund at the DeKalb County Community Foundation. This new fund provides a way for people and organizations to give back in support of the Sandwich Fair Association. Donations received will support the mission of the Sandwich Fair Association, Inc. Started in 1888, the Sandwich Fair is the oldest continuous county fair in Illinois. Although the beautiful Sandwich Fairgrounds of approximately 182 acres is used for other events during the spring, summer, and autumn, the main event continues to be the Sandwich Fair in DeKalb County, attracting approximately 175,000 attendees over the course of the five days of the fair. Remaining to the original mission of the fair, the Sandwich Fair continues to provide agriculture exhibits and competition along with commercial exhibits, food, entertainment, carnival rides, and games for education and fun for all ages. Created in November 2017, the Sandwich Fair Association Fund joins two other funds at the Community Foundation, all for the benefit and ongoing support of the Sandwich Fair Association. 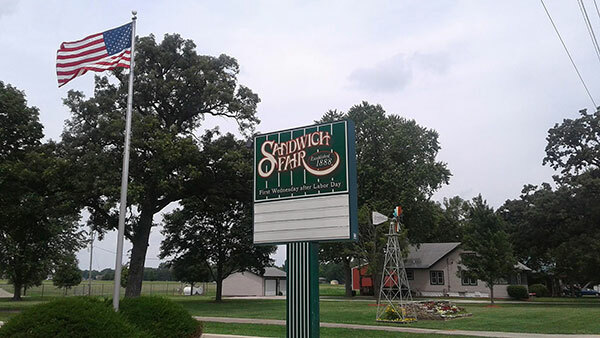 Created in 2005, the Friends of the Sandwich Fair Fund is solely dedicated to support capital building and improvement projects on the Sandwich Fairgrounds. A third fund, the Sandwich Fair Association Endowment Fund exists in perpetuity to support the mission and operating needs of the Sandwich Fair Association, Inc. The endowment fund is funded by the purchase of memorial bricks that are placed at the Round Office Pavilion. To learn more about how to donate a memorial brick, click here. Donations to any of these three funds are tax-deductible and invited from individuals, families, and businesses who want to support the Sandwich Fair in a variety of ways. Estate gifts can also be made to these funds; as well as the option for donors to create their own named fund through the Community Foundation to support the Sandwich Fair in general. Agency funds are a simple, yet powerful solution for any nonprofit organization to consider. The Community Foundation handles administrative and investment responsibilities, freeing the organization to pursue its mission. To make a donation to any of the funds supporting the Sandwich Fair Association, please visit dekalbccf.org/donate. For additional information, please contact Executive Director Dan Templin at 815-748-5383 or dan@dekalbccf.org.